Sister Mary Paynter, O.P. (Sister Maria de Ricci, OP) was born May 23, 1931 in Madison, Wisconsin. She grew up in a house located on the site of the present City County Building, her father, the owner of The Monona Tire Company and her mother, the landlady of the family boarding houses on the same street. Her first school was Doty School, then Edgewood High School, where she became interested in English literature. Sister Mary would go on to get a B.A. in English at Rosary College in River Forest, Illinois (1952), an M.A. in English at the University of Wisconsin Madison (1953), a fellowship at the Sorbonne, University of Paris (1953-54), and a Ph.D. in English Literature, with a minor in Art History, at the University of Wisconsin Madison (1965). The titles of her dissertations are: The Churches Banquet: a study of George Herbert’s ‘The Temple’ and The evolution of the garden motif in Flemish painting of the 15th and early 16th centuries. 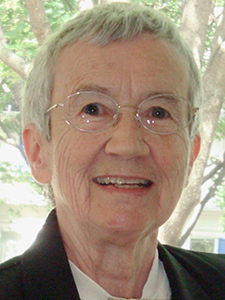 Sister Mary taught English Literature at Rosary College and at Edgewood College.